Here it is. My final delivery as a Julep Maven. I have enjoyed my time as a Julep Maven but I have decided to cancel my subscription and pursue other cosmetics options. It’s not you, Julep, it’s me. I hope you’ll check out my upcoming post reviewing all the polishes and other goodies I received from Julep since subscribing back in July. 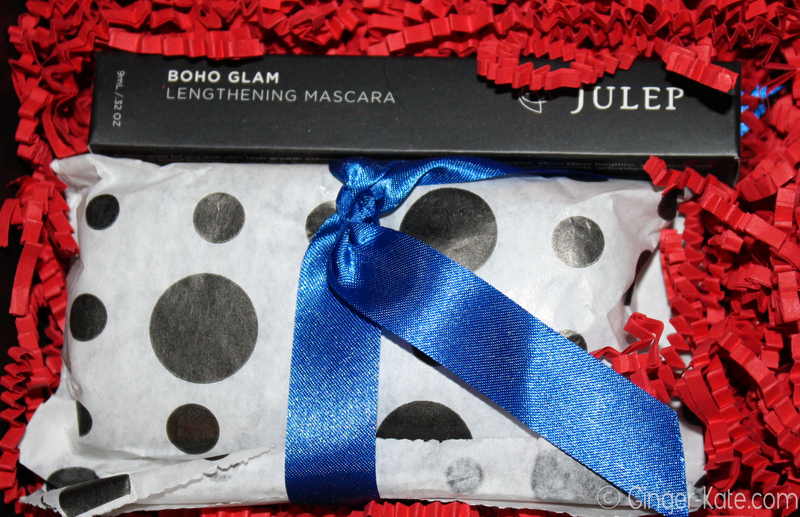 I’ll post that Julep review sometime in December but for now, let’s see what my November 2012 Julep Maven box brought to Ms. Ginger Kate, shall we? Always delivered on time and wrapped up all pretty. 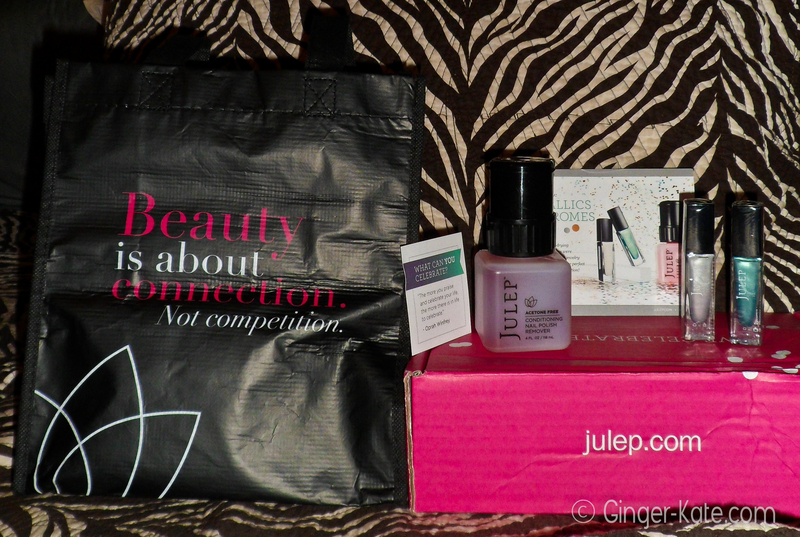 Julep really does a great job with their Julep Maven services. Their customer service team is also quite amazing. Although I was classified as an “It Girl” when I originally signed up to be a Julep Maven, I opted for the Bombshell Box this month. In the past I have swapped boxes as well. The ability to swap your intended box for another box each month is one of the features I liked most about being a Julep Maven. 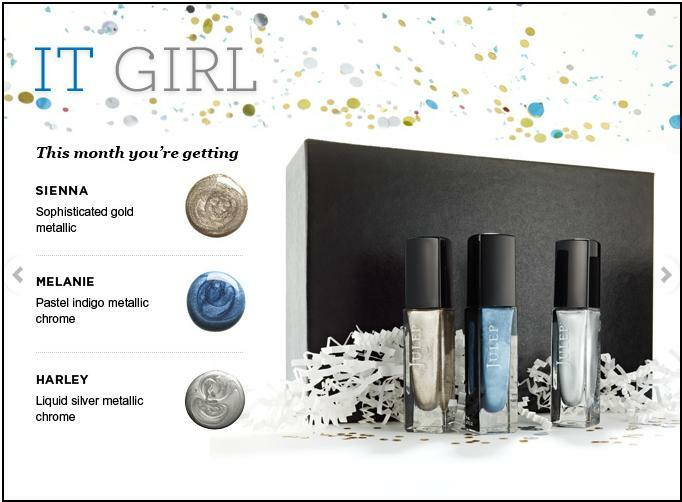 You also have the option of skipping a month or sending your box to a friend as a gift. All are great options for a subscription beauty box service. The first polish I received is a deep, glittery purple. The color is named, Trina. I love this color and purples are a big trend we are seeing throughout the fall and winter this year. Next up, Donna, a peacock blue. I love this color as well. In fact, I’d say that Trina and Donna are my two favorite colors tat I’ve received since becoming a Julep Maven. My third product, this month, is Julep’s Pink Grapefruit Body Frosting. I don’t normally like receiving anything other than nail related products in my Julep Maven boxes, but this body frosting is fantastic! The smell is absolutely amazing! As a bonus, Julep through in three of their nail polish remover pads. They’re pretty effective too! When I received my box I wanted to try on Donna and Trina right away and so I whipped out one of those pads, removed my polish and experimented with my new colors. I removed the polish from all ten nails very easily with only one pad. Sometime the nail polish remover pads end up spreading the polish all over my fingertips but not these. So that’s that. My final Julep Maven box. Please check out my upcoming Julep Maven review of all that I have received whilst a Julep Maven. It may inspire you to become a Julep Maven yourself! The August theme was “Chrome Metallics”. 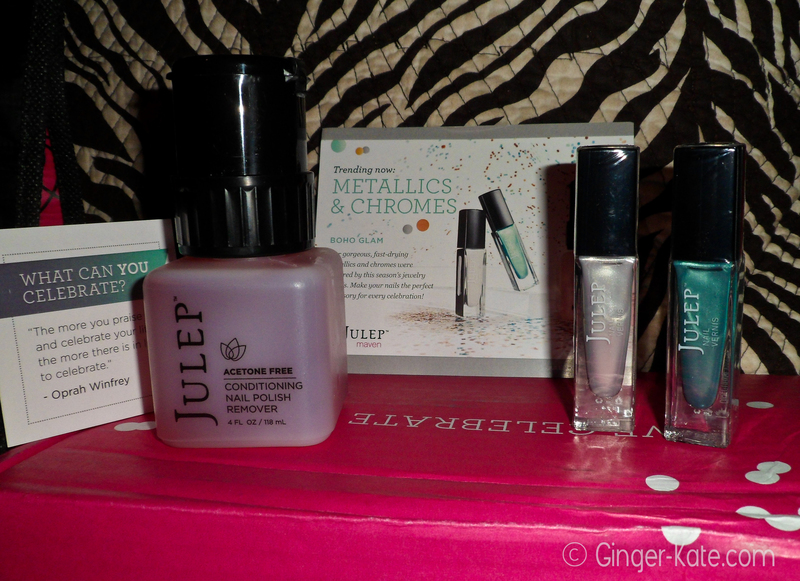 I received a white metallic, Isla, a teal metallic, Piper, and bottle of Julep’s acetone free conditioning nail polish remover. As an extra, they threw in a flimsy “tote”. I received my first Julep Maven box for only $0.01 when I used a promo code but this box cost me the full monthly subscription cost of $19.99. I have to be honest, when I get to review my Julep Maven box for September later this month, unless I REALLY like whats being sent, I’m totally cancelling my subscription. I’m not 100% unhappy with what I’ve received and for $20 total, I got 5 polishes and other goodies; not too bad. 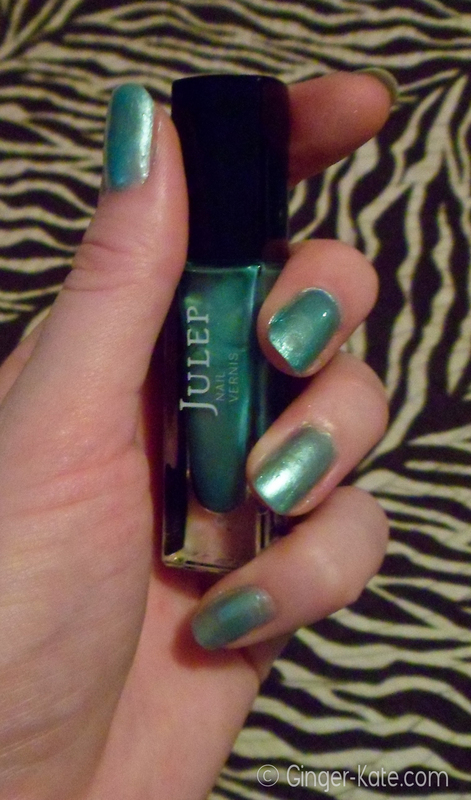 However, I’m not overly impressed with the quality of Julep’s polishes. The coverage is thin and immediately after drying, the color becomes quite dull and lackluster. I do like the nail polish remover; it has a pump top and works really well. Thats what Piper looks like after 3 coats. It’s cute. Isla, the white metallic, is very thin in coverage but looks cute and pearly. (I didn’t get a chance to snap a pic). We shall see if I last another month as a Julep Maven or not. 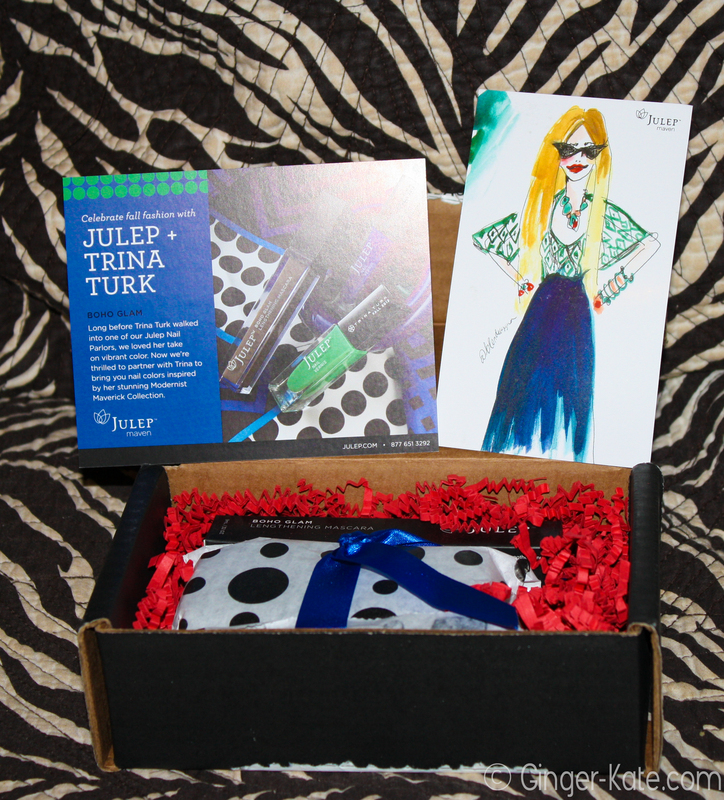 Just under a week ago, I received my very first Julep Maven box! Being a Julep Maven means subscribing to receive a box of Julep nail polishes and other goodies each month. The monthly fee is $19.99 but you are guaranteed to receive at least $40 worth of goodies. I decided to give this subscription service a try when I learned that I can receive my first box for only $0.01 by using the current promo code when signing up. I was also convinced by how the sites features the options to skip that month’s box without being charged, send that box as a gift or even swap boxes to try another style’s monthly box. 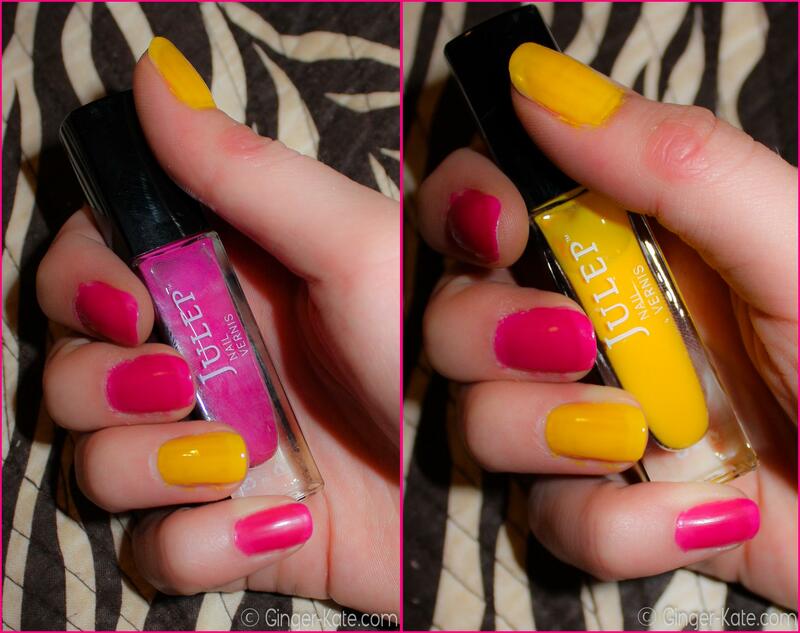 3 Julep nail polishes: Lily (fuchsia), Daisy (lemon yellow) and Sasha (melon). I also received a set of toe dividers. Not a bad introduction. 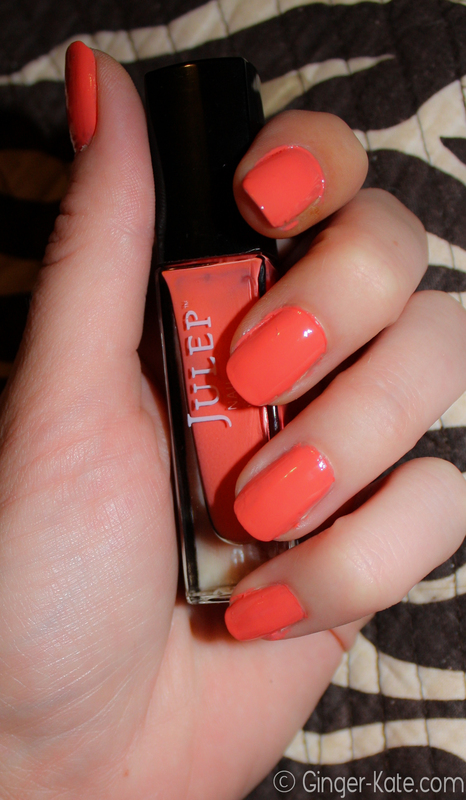 Julep nail polish – Sasha – fresh, cantaloupe melon creme. My favorite of the three colors was Sasha. I rocked this color when I saw The Dave Matthews Band over the weekend. It covers well after just one coat, but looks even better after the second coat. It also dried quickly as did the other two colors. I like how bold both Lily and Daisy are and will most definitely be rocking these both. However, neither covers particularly well and takes at least three coats. Both dry quickly but one Lily dries, it isn’t very shiny. I may be new to being a Julep Maven, but I have already taken them up on their offer for me to select a different box for the month of August. Classified as an It Girl, I was due to receive the above pictured box for August. After checking out when the other boxes would contain, I opted to receive the Boho Glam box. Although I’m not getting the third polish, I think I’ll like the two polishes in this Boho Glam box better than those in the It Girl box. I’ll be back next month with my review of Julep’s Isla, Piper and nail polish remover. Check back then! 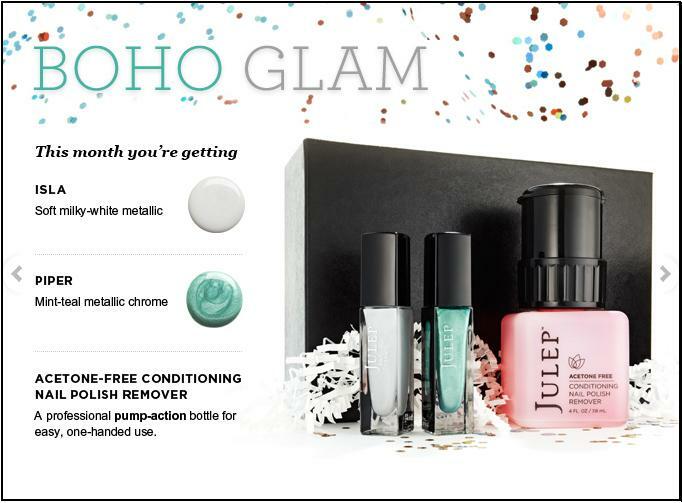 Or sign up now and explore Julep nail polishes yourself!